Welcome to the final entry of the 2014 Matinee Culture fall pilot watch. As usual, this fall Ryan watched (almost) all of the scripted network TV pilots to bring you some brief reviews, hopefully cutting down on the time you might otherwise waste checking out “Selfie.” Shows will be rated on a scale of “Watch it,” “Try it,” “Skip it” or “Avoid it.” Let’s dive in! This time, Ryan reviews “Jane The Virgin,” “Marry Me” and “Constantine.” All times are eastern. One-sentence summary: At once a parody, homage and imitation of the telenovela, the show follows the wacky life of a virgin Latina who is accidentally artificially inseminated at her gynecologist’s office. I was surprised by “Jane The Virgin.” The show’s premise is so utterly contrived and dumb, as well as ripe for melodrama, that it didn’t seem plausible that I would find it anything but distasteful (and remember, I like crazy TV show concepts). What I watched, however, was a solid 42 minutes of a deftly told story that was funny when it needed to be, affecting when it needed to be, and utterly confident in its own voice. That doesn’t mean I’m going to watch “Jane The Virgin” on a weekly basis – even served with a wink and a nod, the telenovela form is never going to provide a long-term allure for me – but the pilot was good enough that I’m curious to check in on the show at midseason and see what people are saying. It’s legitimately funny (much more so than almost all of the new “actual” comedies I watched this season), it portrays a culture and value set not often seen on TV, and the show should be a star-making turn for lead Gina Rodriguez, who is charming as all get out. The strongest element of the show, however, is the tone. 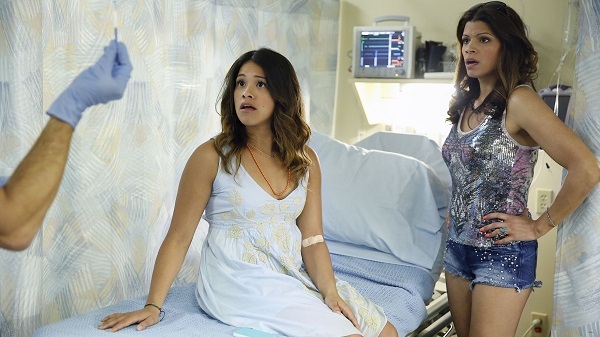 Intercut with scenes from an in-show telenovela, “Jane The Virgin” wears its Hispanic soap influence on its sleeve, giving it a uniquely goofy voice. A sonorous Latin tone narrates the proceedings, on-screen captions punch up character introductions with jokes, and the plot is knowingly overcomplicated. It’s not a perfect show (the characterization and performance of Jane’s boyfriend, played by Brett Dier, leaves much to be desired), but it will and should strike a chord with a certain audience. One-sentence summary: Long-time couple Annie (Casey Wilson) and Jake (Ken Marino) are finally ready to get married, but they still have a bit of dysfunction to work out. “Marry Me,” like the Wilson co-starring and David Caspe-created “Happy Endings” before it, is a low-concept comedy that uses a marriage-related framework in its pilot to launch a show about relationships and hanging out. Unlike its predecessor, Caspe’s followup can’t boast what might have been the best ensemble comedic cast on television, but Wilson and Marino still make up a pretty solid comedy duo, and the ancillary characters do a pretty good job. It is hard to describe “Marry Me” beyond its one-sentence summary, because that’s basically what it is: a meditation on relationships, the nature of commitment and what it means to be married, laced with some very funny jokes and performances. If anything, I would like the show to have even less of a framework; its “insights” on marriage are much less successful than the comedy. But the comedy does work, putting the show heads and tails above every other network half-hour that premiered this fall. I’ll be curious to see how “Marry Me” is received by the viewing public. Like cult favorite “Happy Endings” before it, the show presents deeply flawed characters who are likable but can come off as abrasive. The pilot opens with a long cringe comedy scene that I found delightful but others might find a turn-off; it’s a specific type of humor, but the show pulls it off well. One-sentence summary: DC/Vertigo Comics’ John Constantine, exorcist and master of the dark arts, travels around the country fighting supernatural threats and waging a losing war with his past. I don’t have a lot of affection for the comic book character Constantine, whose appearances have gone mostly unread by me outside of his debut issues in Alan Moore’s “Swamp Thing” run. Even so, the character on display in network TV’s latest supernatural case of the week enterprise seems a bit neutered from his origins. He’s a traveling exorcist, not a occult expert who can only really be bothered to take on the biggest cases. He’s a bit unpleasant but a nice guy a heart, not like the antipathic cur that sometimes had to step up to do the right thing. Perhaps most strangely, NBC has forbid him from smoking, an odd requirement for decency on a show packed to the gills with violent imagery and portrayals of possession. Supernatural adventure is being done to death on TV right now, and if that’s what you want, there are other places to get it – “Sleepy Hollow” and “Grimm” spring readily to mind. 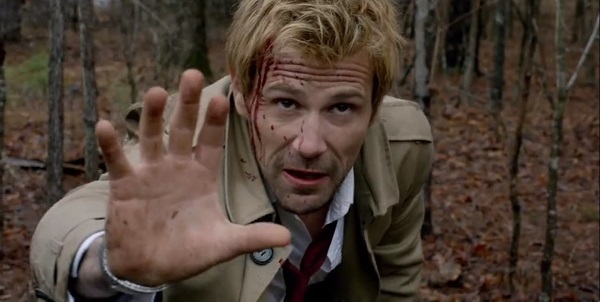 “Constantine” offers a few decent scares and at least one hopeful hint toward tying in with some other aspects of the DC Universe, but it all seems a bit low stakes, and the dialogue and exposition is pretty lacking – to say nothing of the odd machinations of the pilot, which spends its time establishing a female lead who was intended as a costar but was then written out of the rest of the show before it could make to air. The best part of the pilot is its star, Matt Ryan, who certainly looks the part along with doing his best to appear as British and curmudgeonly as possible. He’s limited by a lack of ambition and cleverness among the show’s writers.